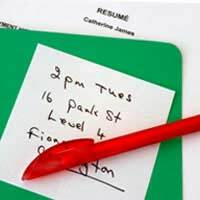 Home > CV Considerations > What If You Have a Criminal Record? You may have a criminal record, but that doesn't mean you can never find employment again. However, you'll need to be very selective and savvy when it comes to organising your resume or curriculum vitae (CV) and handling questions during job interviews. Here, we'll look at a few tips that can help you move past your history and into a fulfilling future. If you were recently incarcerated and lost your last position because of your brush with the law, you might want to switch from a reverse-chronological CV to a skills-based one. Though the former is the standard way that most individuals construct their CVs, you may find that the latter style is more appropriate for your needs. Rather than listing all your jobs by dates of employment (as you would on a reverse chronological CV), you will be highlighting only those positions you held (sans dates) which are appropriate for the job you're now seeking on your skills-based CV. For example, if the position you'd like is in customer service, your CV "Employment History" section will only focus on jobs you've held that focused on sales, marketing, and/or the public. Thus, if you worked in a different type of industry at some point in your career, you should leave it out. If you have to fill out a pre-formatted job application, you may be asked if you have ever been imprisoned, fined (other than for a traffic violation), or otherwise penalized as a result of an illegal activity. In this case, it's imperative that you tell the truth. If you simply cannot fathom the thought of others knowing you were jailed, then this is not a position for which you can ethically apply. At your job interview, you will be asked many questions, and any gaps in your employment history may come to the forefront of the discussion. Should the talk turn to why you spent time out of the workforce, it's best to remain calm and explain your situation in as matter-of-fact a tone as possible. Rather than becoming indignant, be forthright and assume responsibility for your past. Unfortunately, I allowed myself to be influenced by others who were not looking out for my or their best interests. As a result, I was arrested and served time. During my incarceration, I had the opportunity to attend many seminars, take classes on leadership, and undergo sessions geared at helping me improve myself. I am actually grateful to have been stopped, because I was headed for a personal train wreck. Today, I am a much more responsible, focused, and humbled individual. This type of answer is carefully worded to show that you are willing to take responsibility for your past actions and that you wish to move forward with your life without blaming others for your misdeeds. Your interviewer will be left with the impression that you are truly repentant; consequently, that may be enough for him or her to overlook your criminal record and offer you a chance to work for the company. After you accept employment, it's critical to realize that someone may uncover your past criminal history and want to confront you about it. Plan your response to that inevitability well in advance. "I would rather not discuss it," or, "What would you like to know?" are good responses that put the onus squarely on the inquirer and take some of the focus off of you. Though having a criminal record is never easy, with time and patience, it will become less of a factor as you work hard and show others that you have, indeed, changed and grown.